It’s barely been a month since The CW announced that it was creating a series based on D.C.’s Deadman character, and already he’s being overshadowed—as he so often is in the comics—by The Spectre, which Fox is developing as its own supernatural superhero show. Like Deadman, The Spectre is the avenging spirit of a murdered man, tasked with returning to right various wrongs, and dispense "ultimate justice" to earthbound mortals from beyond. But while they work similar territory, even ardent Deadman fans have to admit that The Spectre got most of the good stuff. Oh, so Deadman’s main powers include invisibility, flight, and the ability to possess any living body? That's nice. The Spectre just has the power to do, y'know, anything: He's all-knowing and virtually limitless in his abilities, which even include shaping reality to his will. But the possessing bodies thing, that's also useful sometimes, probably. 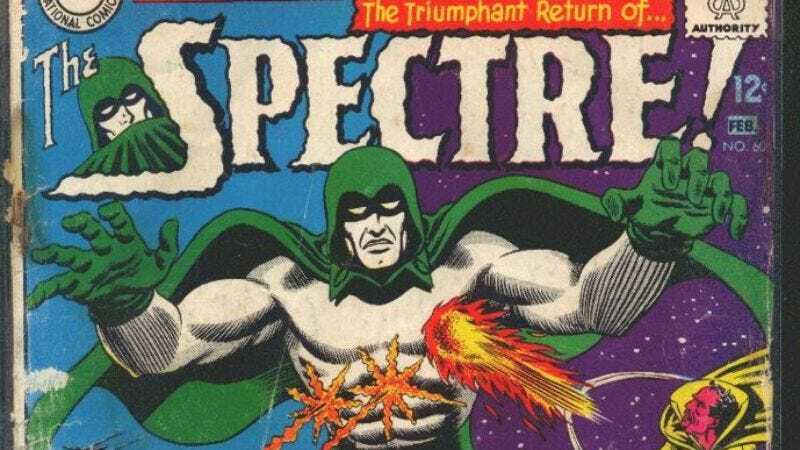 Of course, The Spectre also doesn’t have to wear a big, dumb red collar, and is a murdered cop instead of being a murdered trapeze artist—and ever the bigger man, The Spectre has the courtesy not to laugh about any of this stuff whenever he and Deadman get together. So essentially, should these shows actually go to air, the old “Spectre vs. Deadman” argument that D.C. Comics fans have been having for decades will be borne out across The CW and Fox. Though for once, Deadman may actually have the advantage, seeing as his show is being mounted by Supernatural creator Eric Kripke, while The Spectre only has Brandon Camp in his corner. Still, maybe don't count out Camp just yet, as he does have experience telling stories about mysterious, omniscient men helping others on his short-lived former Fox series John Doe, and has also proven adept at evoking feelings of torturously slow, agonizing death in his 2009 Jennifer Aniston romantic comedy Love Happens.